Interesting guest post by DinarDirham, who are a new blockchain technology platform addressing the issue of volatility in cryptocurrencies by connecting actual gold to blockchains. The term “Fintech” is an extremely broad term, as the field has exploded as of recent times. And the following infographic was meant to cover the field in a broad sense, there are many topics within Fintech that could each be discussed in much greater detail than we are able to do with the limited time and space we have available, or that you would probably have time for. In short, Fintech stands for “Financial Technology” and it speaks to technology which deals specifically with financial services & financial products. You want to talk about digital cryptocurrencies, like Bitcoin & Ether… Fintech. You want to talk about the blockchains that make them possible… Fintech. You want to talk about ATM machines… Fintech! In general, Fintech has been driving the financial market into the future with technology. Faster payments, better safety protocols, new ways of thinking about money, and much more, are all being innovated by companies within the Fintech industry. As new breakthroughs in the industry happen and take off with success, more and more innovations must happen to accomodate them and to spring off of their success, as did happen with the advent of Bitcoin and the Blockchain technology behind it. Suddenly, a few years later, we have companies creating newer and easier ways for businesses to accept Bitcoin, we have innovations within Bitcoin itself, we have the rise of many different cryptocurrencies, the rise of a new blockchain platform, such as Ethereum, expos and conferences dedicated to driving these and other innovations forward, new regulations and definitions needing to be created, and much more. DinarDirham for example, is the result of a culmination of the dreams of eGold and the coming of blockchain technology, which was not previously available, and which solves many problems from before which were harder if not impossible to address. DinarDirham is a gold fintech provider, in other words, we offer gold-backed digital products/assets to our customers. We hope that our innovative company will help change the way people buy and interact with gold, and will do so digitally… digital gold. We’re just a small example of an innovative company spring boarding off of the success of other fintech breakthroughs. Just visit our site and see the partners and technologies we’ve incorporated into our company, and you’ll get a bit more of an appreciation for Fintech, and the intertwining of new financial technologies that make a new innovation possible. *Top Fintech companies of 2016. *Countries that are the most supportive of Fintech companies, both now and with outlooks into the future. *Hot topics in the Fintech industry. *The relevancy of Fintech today and into the future. *Some of the most influential people in the Fintech industry during 2016. *Fintech startups in different countries – both in developed and developing countries. *List of the top 5 Fintech Unicorns (with the valuations). *Some of the best popular Fintech startup incubators. *Some of the biggest Fintech startup acquisitions. *Fintech investments from 2012 – 2016. *Bank investments for Fintech sectors. 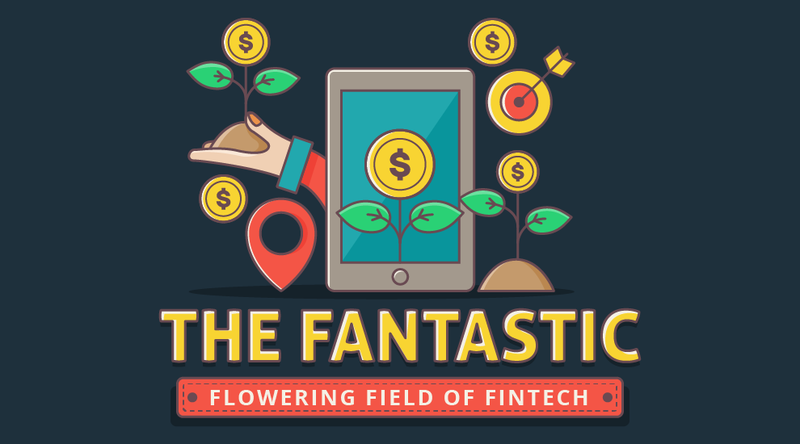 We hope you’ll enjoy this wonderful and extensive infographic about The Fantastic Flowering Field of Fintech. And thank you for visiting DinarDirham. Please keep in touch through one of our social media channels, we’d love to hear from you, answer questions, and keep you up to date with what we’re doing. We always keep our audience up to date on developing news and information. Enjoy the infographic, and again thanks for stopping by.